What happens when there is no more land left, and the humans who survived the catastrophe band together into pirate gangs to kill eachother? Can an honest captain with his frigate stay alive in this dangerous place? When will the madness stop? Download Sea Wolves forthe answers. 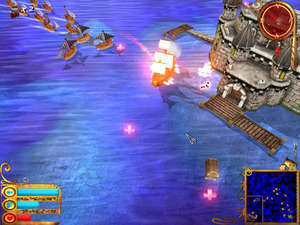 Sea Wolves 1.03 is a shareware program and can be used as a demo to try the software until the free trial period has ended. A full version of the program is available after the trial period ends. For security reasons, you should also check out the Sea Wolves download at LO4D.com which includes virus and malware tests. Additional screenshots of this application download may be available, too. Sea Wolves has a presence on social networks.